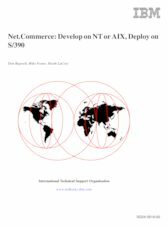 This IBM Redbooks publication will help in understanding how to develop OS/390 Net.commerce solutions using Windows NT or AIX platforms. The approach presented in this book allows OS/390 Net.Commerce application development activity to be performed on either the Windows NT or AIX platform and then be ported to an OS/390 server for final testing and deployment. The approach outlined in this book allows for full advantage of the features and capabilities of both the development and deployment platforms. By allowing designers of e-business solutions to work on the Windows NT or AIX platform enables them to maximize their productivity through the use of workstation tools along with the flexibility that these independent systems afford the developer. When testing and debugging is completed on the workstation, the application is then ported to OS/390 for final testing and placed into production. By placing an application into production on the S/390 server, allows full advantage of the reliability, scalability, and security strengths of the S/390 environment along with access to all key business applications and data of the S/390 host system. The experience of a customer’s implementation of the concepts presented in this book is included along with lessons learned during the project. Using the insight gained in this implementation can increase the success of projects while improving application development activity. A working knowledge of the various environments supported by Net.Commerce is assumed. These include the operating systems referenced in this book: Windows NT, AIX, and OS/390, as well as the DB2 relational database management system and the functions of the Internet and Web servers.